January 2017 Book of the Month! First Book of the Month for 2017! W. Macqueen-Pope; Ghosts and Greasepaint. A story of the days that were. Red Cloth, 334 pages, published by Robert Hale. 1st Edition 1951. 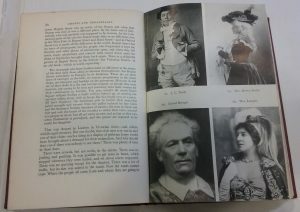 Six references and a photograph of Lily Langtry. This book, plus hundreds of others can be found at Cornucopia at the Corn Xchange.